Next to Normal, at the Tannery Arts Center’s Colligan Theater. Live theater is one of the most powerful ways in which art communicates the human condition. If ever a show has captured the complexities of the psyche and the complicated moods of family members, it is the multi-award winning musical Next to Normal, with book and lyrics by Brian Yorkey and music by Tom Kitt. Praised by critics with major national publications and wildly successful on Broadway, this deeply compelling and personal play is now being presented on a Santa Cruz stage by the Jewel Theatre Company. Jewel Theatre Company, Santa Cruz’s only year-round professional theater group. This unique, modern musical is the winner of 3 Tony awards (including Best Musical Score), and became the eighth musical in history to receive the honor of Pulitzer Prize for Drama in 2010. For those unfamiliar with it, the play tells the story of characters with lives that are anything but normal. The play revolves around the mother, Diana, who struggles with a bipolar disorder that is worsening. While exploring the effect the illness has on her family, the musical also addresses other modern day challenges including grieving a loss, suicide, drug abuse, ethics in modern psychiatry, and suburban life. During the course of the intensely emotional but energetic two-act pop/rock drama, Next to Normal takes the audience into the inner worlds of 6 people by presenting one family’s story of struggle with a sympathetic heart and cathartic humor. The contemporary score draws viewers into the individual experiences and relationships of each character, and the drama provides an opportunity to have an altered and enlightened perception of what it means to cope with the effects of mental illness and family dynamics. This moving piece of theater reflects the wide-ranging and groundbreaking material explored and performed by the Jewel Theatre Company, Santa Cruz County’s only year-round professional theater group. Led by Founder and Artistic Director Julie James, the company is now celebrating its 12th season entertaining the community with eclectic work that includes dramas, musicals, comedies, and classics. 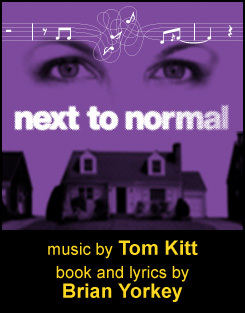 Next to Normal is directed by Julie James, alongside Musical Director Katie Coleman, and Choreographer Lee Ann Payne, who also stars as the lead, Diana. The cast includes 5 other roles played by new and seasoned professionals who are accompanied by a 5 member band of local musicians. The current season marks the second year JTC will be performing as resident company of the Tannery Arts Center’s newly renovated Colligan Theater. As well as live theater, the highly adaptable venue also hosts presentations of music, dance, and film. With seats aligned for easy viewing and close proximity to the large stage, the Colligan theater offers an engaging experience that works well for more intimate shows like Next to Normal. JTC’s 2016-2017 season lineup features 5 plays. After the recent production of A Streetcar Named Desire and the current performances of Next to Normal, audiences can look forward to The Book Club Play, The Dance of Death, and Sylvia in 2017. 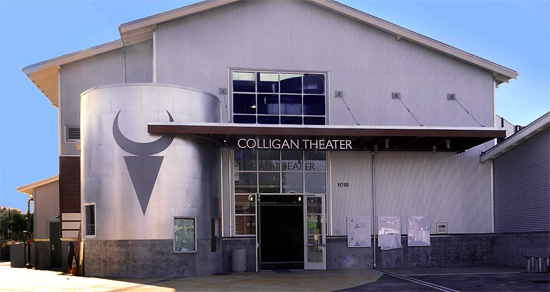 Colligan Theater at the Tannery Arts Center. Next to Normal is playing at the Tannery Arts Center’s Colligan Theater November 16 – December 11, 2016. To purchase tickets, visit the Jewel Theatre Company website.